Recommend for: All ages, mild sci-fi lovers, those looking for a short read, those wanting to support homeschool authors. Can I be honest? I don’t read a lot of Sci-Fi because I don’t like most of it that is out there. I know, this is hard to believe coming from a science fiction writer, but it’s true. 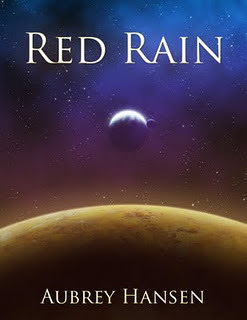 Red Rain was a resounding exception. One day, while working on Homeschool Authors, I found out about Aubrey Hanson. When I stumbled on her website, I saw that there was a free audio book. One day while I was busy mindlessly entering data into the computer at work, I put on my head phones and started listening to the book. I was hooked from the first few sentences. In fact, I stayed up late when I got home (even though I had to get up early the next morning) to finish the book. First off; Grace Pennington, the girl who read the book, has an amazing voice. If I ever had an audio book done of my books, she would be the one I would choose to do it. The suspense was excellent and made me frustrated when the downloader didn’t buffer fast enough to keep up. I loved the faith displayed in this book. Without giving anything away, in the end they make a decision that goes against what many Christians would have chosen. It is the hard, much less traveled road of doing what is right, even if sets you back personally. I applaud Aubrey for the courage she showed in her writing. One of the best things about this book is you felt you were in a real place. You could see the place where Philadelphia lived. You good feel the cold, hard walls of the star base. It all seemed so real, so believable. Does too-short and wish-there-was-more count? I encourage you to listen to it for yourself and then, if you like it, show your support and buy the book.